October. I’m trying to love October. So many people love October. It’s pretty, its crisp and colourful, but it also means winter is right behind it. We’ve already had snow, for heaven’s sake! This is why I don’t love October. So that’s what brings us to today’s adventure…my quest to love October. I decided to stop whining and get out and enjoy the colourful, crispy leaves…and afternoon sun that autumn can sometimes bring along. 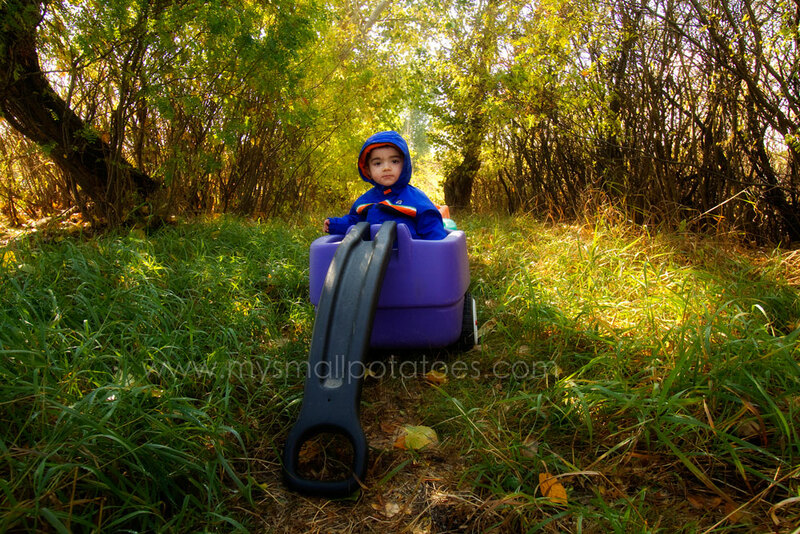 I bundled up the smalls and we headed out in our 4-seater wagon. I let them loose in the woods and asked them to gather as many leaves as they could manage. They hunted and gathered and chatted, and explored while I watched and learned. You know what I learned? I learned that the smalls love October. They live in the now. They are not worried or even thinking about what may follow October! They are experts at just being present. They gathered leaves from every corner of our little wooded pathway… Some of them didn’t make it into our paper bag. Some of them were for me! When the smalls thought they had collected enough leaves, we started loading up the wagon to head back to the house… All Aboard!! When we got home, we gathered around the kitchen table and poured out our pile of leaves. I gave them paint chips from Home Depot with the colour’s name written on them. I explained how I thought we should try to sort all the leaves we found by colour! They thought this was a great idea! One by one, they each took turns choosing a leaf from the pile and putting it on the corresponding paint chip card… In the end, we concluded that most of our leaves were brown. A few were orange. Even fewer were orange. And we did not find any purple or red at all. It was a really great activity to facilitate learning the concepts of “less than” and “greater than.” You’d think maybe that’s where our adventure ends. Nope. We are never finished until we’ve made a bit of a mess, remember? I pulled out some glue pots and paper and the smalls worked on their day’s report…just a little something for their parents to see what they’ve been up to in the day. So, do I love October? Maybe a bit more than I did before this activity. But does that really matter? Nope. I love a good adventure, and that’s what it’s all about. The smalls are good examples of this…everyday. Now, today is the Weekly Kid’s Co-op, so you have no excuses for not having some sort of adventure today! Click the link below and get exploring! There are always SUCH great ideas! And if you have an adventure or activity to share, click the link and follow the simple instructions…we’d love to see what you’ve been up to! Link the Co-op back on your blog somewhere so your readers will know and be able to come play, too! “They live in the now. They are not worried or even thinking about what may follow October!” I’m very jealous of this ability, I love fall, but I do let just the notion of winter being close bum me out. Victoria, I’m with you. I too, am envious of their powers of living in the present. I do NOT like winter. Nope. Not one bit. Glad you enjoyed the post, though! 🙂 Thanks for taking the time to comment ! This is such a wonderful idea. I loved the use of the paint chips – very clever! You always come up with the best activities! I love the idea of the paint chips. Your photo of your daughter handing you a leaf is precious!